The biceps -- like the vast majority of the other muscles in your body -- require at least 48 hours to fully recover after an intense workout. 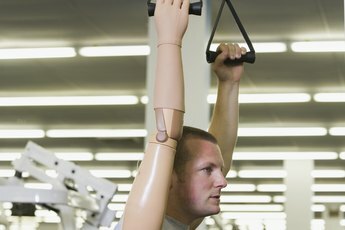 However, the biceps are unique in that they are relatively resistant to lactic acid buildup from anaerobic exercise. They may burn like crazy after a set, but in four or five minutes, they recover almost completely. Therefore, it's difficult to break them down, which is necessary to force them to grow. To break them down, you need to hit your biceps with both an anaerobic and aerobic workout and both at the same time, a burner workout. Burn out with dumbells. Stand in front of the dumb bell rack with your legs 6 to 8 inches apart, your knees bent slightly -- not locked. Select two dumbbells of the heaviest weight you can curl 10 times apiece. Stand holding them at your sides, palms facing toward your legs. Curl one up toward your shoulder. As you raise the dumbbell, supinate your hand -- rotate it so your palm is facing up. Lower the dumbbell back down to the resting position and lift the other dumbbell, supinating your hand as it comes up. Do 20 reps, 10 on each arm. Rack the dumbbells. Without a break, select two dumbbells that are the next weight down. Do 20 reps if you can. If not, do as many as possible, rack the dumbbells and select two more of the next lower weight. Do as many reps of each arm as you can, then rack the dumbbells and select the next lower weight. Do five sets with no rest between. Do burners with a straight bar. Load the bar with as much weight as you can rep 10 times. Load the bar with plates in increments of 2-1/2 to 5 pounds. For example, if you can curl a 15-pound straight bar plus 25 more pounds for a total of 40, load each side of the bar with five 2-1/2-pound plates. Stand holding the bar in front of you with your palms facing away from your body, your feet 6 to 8 inches apart, your back straight. Do 10 reps with the bar. Set the bar down, remove two plates, pick it up and do 10 more reps -- or as many as you can. Set the bar down, remove two more plates and do as many as you can. Set the bar down, remove plates and rep out as many as you can again. Continue doing this until the bar is empty of plates. Load an easy bar with as much weight as you can curl 10 times with plates staggered in increments of 2-1/2 or 5 pounds. Stand upright with the bar in your hands, your hands facing away from your body but at a 90-degree angle in relation to one another, your grip just below the bend in the bar. Curl the bar up and slowly lower it as you count. Lower the bar at a rate that drops the bar from shoulder height to your hips in 10 seconds. Set the bar down, remove two plates, lift the bar and curl it, then lower it back down to your hips in a span of 10 seconds. Remove another plate, curl it, lower it over 10 seconds, then remove another plate. Continue this process until there are no plates left on the bar. Go to the gym early, late or at odd hours, whenever the gym has the least amount of people. A burnout workout requires you use different weights and move quickly through out each set. Competing with others for weights interrupts your burner workout. The first few times you burn out your biceps, don't do too many exercises. Do one or two and only one or two sets of each. Until your biceps become accustomed to burners, don't attempt to devastate them or they will be extremely sore for considerably longer than 48 hours.